We sell Salus products like Floradix® Epresat - Liquid Multivitamin - 250ml online in the UK and directly from our award-winning store in Scotland. Sorry, this product is out of stock at the moment! Would you like to receive an alert email when it's back in stock? If you want to automatically receive an email when 'Floradix Epresat 250ml' is back in stock, just leave your email address below. Floradix® contains herbal extracts and fruit juice concentrates. Vitamins A, B6, C and D contribute to the normal function of the immune system. Epresat is a delicious food supplement providing vital vitamins A, B6, C and D for a normal function of the immune system. Vitamins B1, B2, B6, C and niacin contribute to normal energy-yielding metabolism. Vitamins B2, B6, C and niacin contribute to the reduction of tiredness and fatigue. Vitamins B1, B6, C and niacin contribute to normal psychological functions. Vitamin E contributes to cell protection against oxidative stress. Epresat liquid is easy to take and helps safe guard the balance of vitamin A, D, E, C, B1, B2, niacin and B6. As these nutrients are already dissolved, they are absorbed more quickly by the digestive system compared to tablets. Adults and children over 12 years: 10ml once daily. Children 6 - 12 years: 5ml once daily. This product is free from preservatives, colourings and lactose and is suitable for vegetarians. As official Salus stockist, we sell genuine Multi-vitamins directly from our shop in Scotland and online throughout the UK. Salus, also known as Floradix, sells a wide range of health elixirs and herbal teas. View more products from Salus. Where can you buy real Floradix Epresat 250ml safely online? If you are wondering where you can buy Floradix® Epresat - Liquid Multivitamin - 250ml safely online in the UK, then shop with us. We are an actual health foods shop; with real people selling real foods and products. Our award-winning independent shop is located in Stirling, Scotland since 1976. You can buy our Floradix elixirs and teas and other genuine Multi-vitamins in store or safely place an order with us online or over the phone. 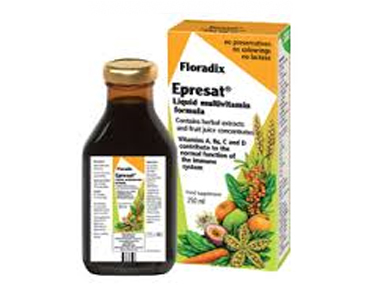 Floradix Epresat 250ml - Floradix® Epresat - Liquid Multivitamin - 250ml in Multi-vitamins and Vitamins and Minerals.